What’s a Pinoy party without a lechon? Surprise! Surprise! I’m not really a fan of “lechon” ~ and it started when in the 1990s my two elder brothers tried to kill a pig for our noche buena. It was their first time and it ended up being sort of a torture for that pig. I don’t remember anybody at home that time who ate the pig. 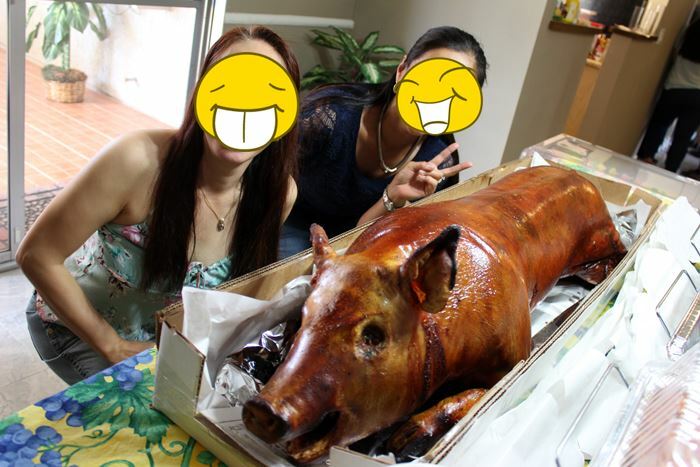 Even at my mom’s party, I wasn’t excited for the lechon ~ and I didn’t touch it until it was time to cook lechon paksiw. I soooo love lechon paksiw and I love the way my mom cooked it back home in Angeles City, but I made the “lechon paksiw” myself through a recipe from Market Manila ~ and it was delish! Market Manila is my go-to site for Filipino food recipes. For Korean dishes, I love ì´ë°¥ì°¨. I haven’t had lechon in Korea in the 12 years that I’ve been living here. I know there was a seller in Bucheon but I never got to order from them. I’m not sure if they are still selling lechon in Korea. I got my order the day after they sent the package. 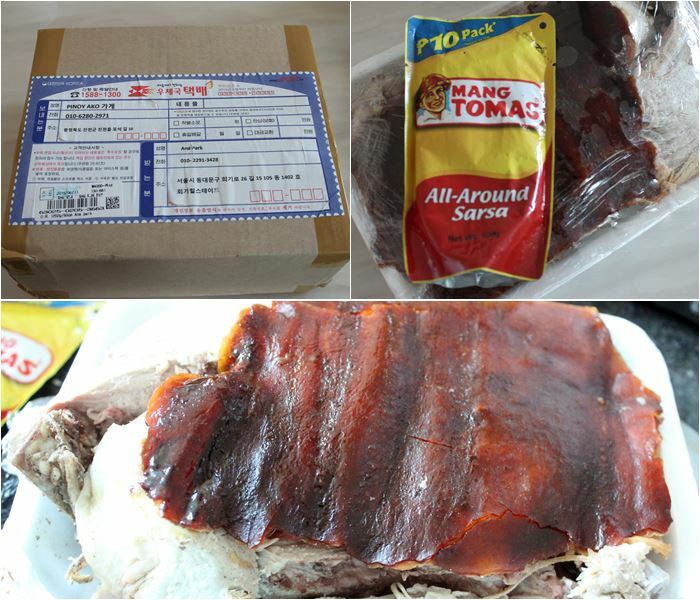 It was in an ordinary box ~ a kilo of lechon with a small pouch of Mang Tomas lechon sauce. Like I said, I’m not really a fan of lechon so I just tried a small piece of the skin and the meat that I reheated in my air fryer. Then I prepared a dip of soy sauce and vinegar, served some rice ~ and then repeat! Hahaha! The meat is tender ~ and I think that’s the best thing about that lechon. I didn’t check if what I got was really a kilo but the next day. I cooked all the meat again, including the two rib bones included, in my four-year old Happy Call pressure pan. 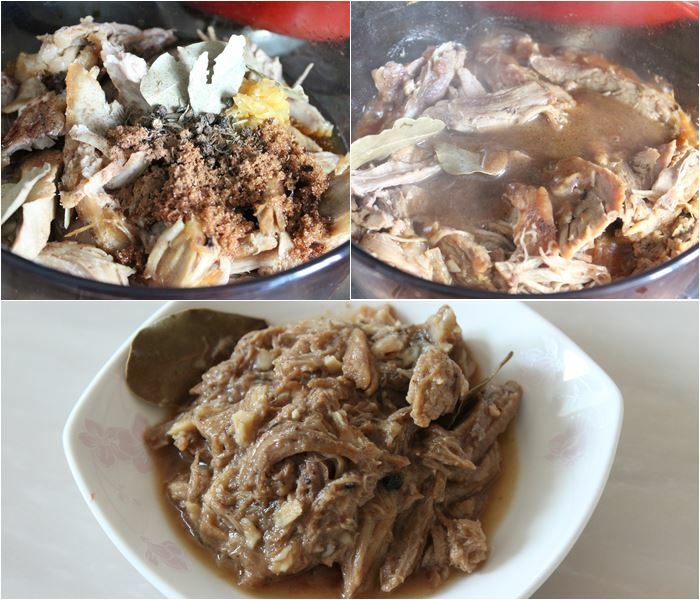 And then I made ~ lechon paksiw! Where did I get the recipe for the lechon paksiw? Market Manila of course! I’ll probably order a whole one sometime in December ~ hehehe. Next Post:Free tourist visa to Korea?